Ever imagined about a sea without a seashore? Is it possible? It is! The Sargasso Sea is the only sea on the Earth without a coastline, a sea without shores. This strange and unique creation of nature is located in the middle of the North Atlantic Ocean and is surrounded by ocean currents. The Sargasso Sea is located in the midst of Gulf Stream on the west, North Atlantic Current in the north, Canary Current on the east and the North Atlantic Equatorial Current on the south. Bermuda Island is near the western fringes of the sea. Even though the Sargasso Sea is surrounded by such strong currents, its currents are largely immobile. Unlike the harsh cold climate of the North Atlantic, the Sargasso Sea is strangely warm. The temperature of the water inside the sea is much more than the water on the outside. Huge mats of dense seaweeds cover the surface of the sea. This floating golden-brown seaweed is known as Sargassum. So the sea is named Sargasso. Columbus discovered this huge ellipse and on seeing the seaweeds, he thought that he was close to the shores whereas he was many hundreds of miles away from the land. The Sargasso Sea is often linked with the Bermuda Triangle. The sea’s calmness and its proximity to Bermuda make it an area of mystery. A fascinating belief is associated with this area. It is said that it robs the people from the sailing boats and therefore several ships have been found wandering without any person in the waters of Sargasso. The Sargasso Sea is also called as the ‘Graveyard Of Ships’ or ‘Sea of the Lost Ships’. One such ship found was a French merchant ship, Rosalie. In 1840 it sailed through the waters and disappeared, but later it was found with its sail sets and no crew members on it. In 1881, an American schooner, Ellen Austin found another ship traveling at a good speed but no crew members on board. The captain sent his crew to this ship, but the ship disappeared. It was found after a couple of days but there was no one on board. Many other ships floating unmanned were found later. One was The Connemara IV in 1955 which was found sailing on its own. Between the 1960s and 1980s, many boats and yachts were found drifting on their own. There are stories of ships that were found with the skeletal remains of the crew members. The exact reasons ofortheir death remained unidentified. Some also believed that the sea algae might be the cause of the death of the members on board. None of the maritime experts are able to solve the mystery of the disappearances till date. 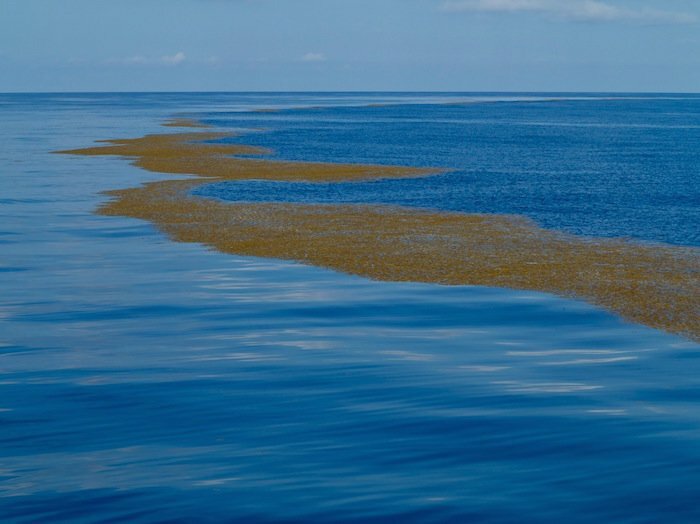 The Sargasso Sea still remains a big mystery. Richard Sylvester of the University of Western Australia has associated the mysterious disappearances of the ships and air crafts in the Bermuda triangle with the Sargasso Sea. Vast amounts of seaweeds accumulate at the center of the sea where the powerful currents slowly circulate, creating a huge whirlpool. Sylvester came up with a theory that the huge whirlpool of the Sargasso Sea is like a centrifuge. This huge whirlpool creates smaller whirlpools that travel out and reach the area of the Bermuda Triangle. These whirlpools are strong enough to rotate a ship and drag it inside. These small whirlpools cause mini-cyclones in the air. These cyclones continue the spiral movement of water, from which they appear, and may thus make small aircraft crash into the ocean.